(CNN) -- A Virginia woman whose husband and daughter were gunned down in last week's terror attacks in India says the attackers should be forgiven. Kia Scherr, left, says her daughter, Naomi, and husband, Alan, were "having the times of their lives" in India. "We must send them our love, forgiveness and compassion," Kia Scherr told reporters Tuesday of the Mumbai attackers, nine of whom were killed by Indian forces. "As Jesus Christ said long ago, they know not what they do. "They are in ignorance, and they are completely shrouded and clouded by fear, and we must show that love is possible and love overpowers fear. So that's my choice." Alan Scherr, 58, and Naomi Scherr, 13, were among 25 people who had traveled to India for a meditation retreat with Virginia-based spiritual group Synchronicity Foundation, to which the Scherrs belonged. Authorities said the father and daughter were found fatally shot in a restaurant in Mumbai's Oberoi Hotel, where the group was staying. Kia Scherr, who didn't go on the trip, said at a news conference in Faber, Virginia, she is experiencing the "deepest grief and pain I have ever known." Synchronicity's founder, Charles Cannon, told reporters Alan Scherr was in Cannon's room at the Oberoi shortly before the attacks began on the night of November 26. They were discussing the next day's activities for the group. "He said that he was hungry and he was going down to the restaurant to eat," Cannon said. Scherr and his daughter were in the restaurant with other Synchronicity travelers when gunmen burst into the hotel and started shooting, Cannon said. One of the travelers, Andi Veragona, told CNN affiliate WTVF that she was trying to play dead during the attack, and that she was trying to calm Scherr, who was next to her. "[He] was panicking, and I put my hand on the back of his neck, and just saying, 'Shhh,' " she told the Nashville, Tennessee, station. "And then I felt a bullet penetrate his head, and he just went limp, and he was bleeding all over me." Linda Ragsdale, Veragona's friend and fellow Tennessee resident, told The Washington Post that she pulled Naomi Scherr under a table but couldn't save her. "I was taking in the enormity of the moment, thinking that this energetic child who I had been playing with in the pool the night before -- and had made a pact to do somersaults with -- was dead, shot," Ragsdale told the Post. Ragsdale's husband, Ben, said his wife and others played dead, but a gunman "decided to shoot into the file of them." Three of the Synchronicity survivors in the restaurant -- including Ragsdale and Veragona -- were shot, and a bullet grazed a fourth. Ben Ragsdale said hotel staff eventually led the four outside, where they caught the taxis that drove them to a hospital. Cannon told CNN's "Larry King Live" on Tuesday that he and two others were in his hotel room when the attacks began. They barricaded the door and remained there for nearly 48 hours, getting information about the whereabouts of other Synchronicity members by cell phone and their room phone, he said. "Slowly, we were able to account for everyone but [Alan and Naomi Scherr]," Cannon said. "And we knew they had been in the restaurant at a table where four of the others who were shot and injured had gotten out." About two days after the attacks began, Indian commandos escorted Cannon and the two others out of Cannon's room, he told reporters at Tuesday's news conference. He said the hotel looked like "a bombed-out war zone." "Bodies [were] everywhere, glass, everything broken and smoky," he said of the hotel, where grenades had exploded and fires had burned. On his way out, police asked him if he could identify any remains, he said. Cannon said he stepped over bodies and walked through pools of blood in the restaurant to get to the table where Alan and Naomi had been sitting. "I found and identified Alan and Naomi, who were laying under the table, heads facing each other and their arms outstretched to each other and overlapping," he said. "It [was] one of the most challenging things I have ever had to do in my life, to identify the remains of two people who I loved like family." Three of the wounded Synchronicity travelers still were in an Indian hospital this week, Cannon said on "Larry King Live." 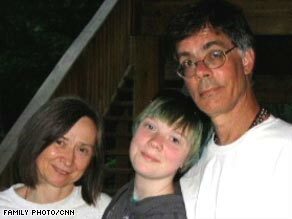 Ragsdale's son told CNN she had been shot in the back, but that the bullet hit nothing vital. Veragona suffered leg and arm wounds. Kia Scherr told reporters she had spoken to her husband and daughter by phone in the days before the attacks, and that they were "having the times of their lives." The trip was the first time Naomi had traveled by plane, and it was Alan's third visit to India this year, she said. "He told me by phone one day: 'I love these people. I could live here,' " she told "Larry King Live."